The Affordable Mason provides expert repair of patio pavers. 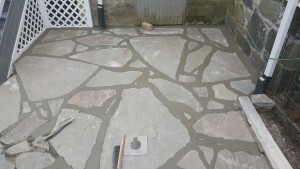 We work with bluestone, flagstone and limestone pavers and can repair any patio, driveway or walkway. We serve southern new jersey from our office in Haddonfield, NJ. Affordable masonry work for stone, brick, block and stucco. Call for a free estimate on any masonry need. 856 558-8735.